Updated Thursday February 7, 2019 by LMLL. 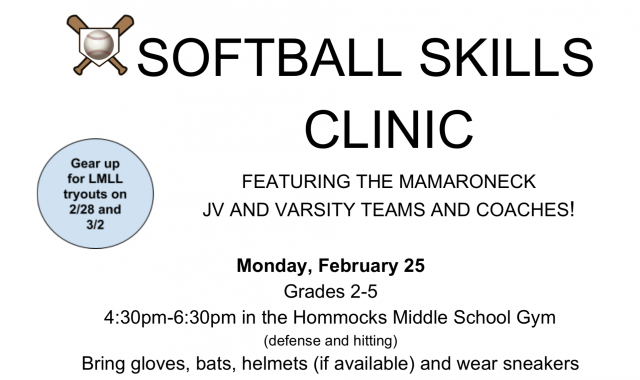 The Mamaroneck High School varsity and JV softball teams will be running a Softball Skills Clinic on Monday, Feb. 25th, from 4:30-6:30 p.m. in the Hommocks Gym. The Clinic is open to softball players in Grades 2nd through 5th and will focus on defense and hitting skills. It's a great way to get ready for LMLL Spring Rec Softball Tryouts, which will be held at the MHS Post Road Gym on Feb. 28th and March 2nd. Registration is $30, and participation will be limited to the first 50 girls to register. Click the PDF below for registration form and payment instructions.